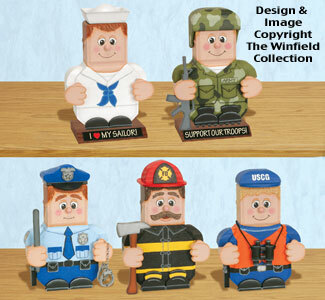 Our newest patio paver pattern set includes a dozen fun Military/Public Servant figures that are easy to make from low-cost patio pavers, small wood pieces and decorative accessories. Trophy base and alphabet patterns plus sources for the keyhole shaped paver stones are included. Figures use indoor/outdoor patio paints and E6000 glue. Patio Paver Bodies measure about 9" tall. You get full-size patterns plus instructions and color paint sheet to make 12 Military or Public Servant Patio Paver Pals (Includes the five shown plus Judge, Sheriff, Marine, Air Force, Military Police, Canadian Mountie and Postman).